With a population of nearly 1.4 billion people, China can be a tough place in which to escape the hustle and bustle of city life. Even when traveling to “small towns” you often find yourself in the midst of millions. 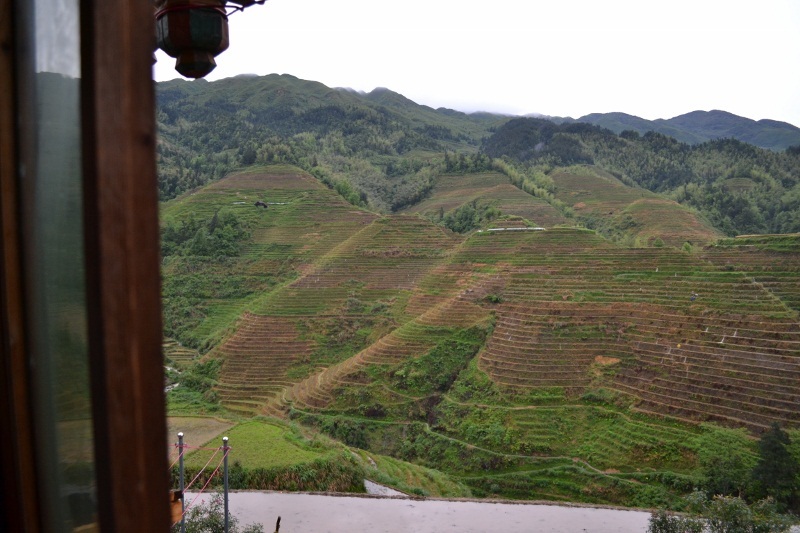 In need of some peace and quiet, we headed towards the Dragon’s Backbone Rice Terraces in Longsheng County. 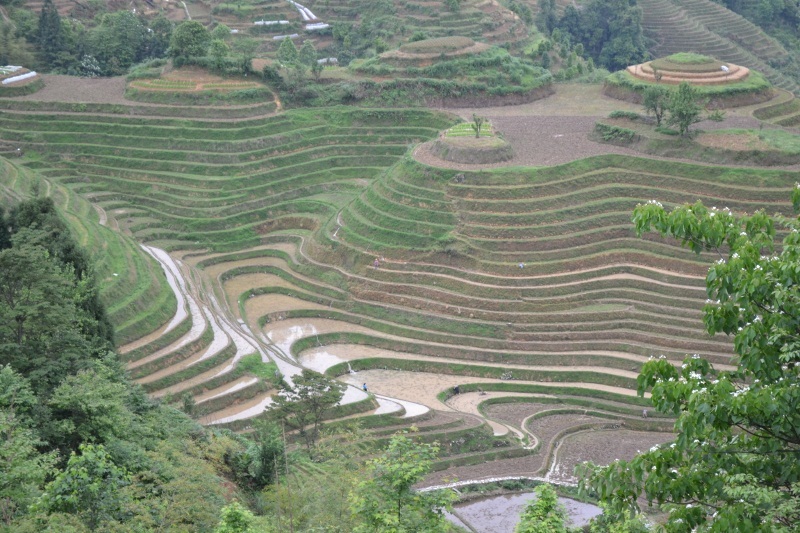 The Dragon’s Backbone Rice Terraces. It only took a few photos to convince us to add this area to our China itinerary. 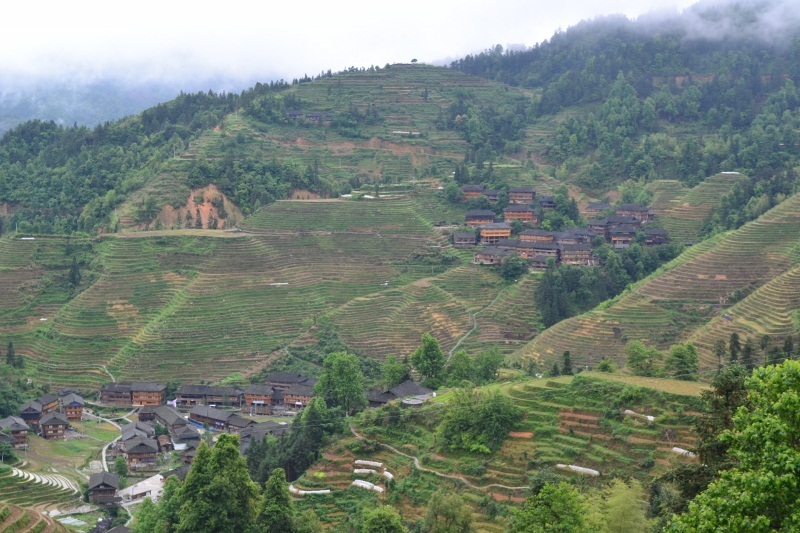 The Longji rice growing region is home to several villages speckled throughout the mountains. The most popular village in the area is Ping ‘an, but popular is not what we were looking for. We wanted something a little more secluded; so we set off from Guilin for the village of Dazhai, which has a reputation as a smaller and more chilled out place to use as a home base for exploring the terraces. As is usually the case when riding buses in China, we were the only westerners on board and weren’t entirely sure where our stop was, but that always helps to build the sense of adventure. After about two hours, we were dropped off at a pretty deserted little bus stop, if you can even call it that, and our bus sped on down the road. Luckily for us, a young Chinese couple from Guangzhou had gotten off the bus as well, and we decided to share a van to Dazhai (thanks to them, we were able to get the real “Chinese” price and we were confident that we were headed in the right direction). When we arrived at the gate to Dazhai, the driver told us that we would have to hike the rest of the way as motor vehicles are prohibited beyond the city gate. Thank God, no motor bikes to dodge for at least a few days! We had found the solitude we were looking for. While very secluded, Dazhai is situated at the base of spectacular terraced mountains, so we decided to continue our trek uphill to another village called Tiantou. Tiantou is even smaller and offers the best panoramic views in the area. 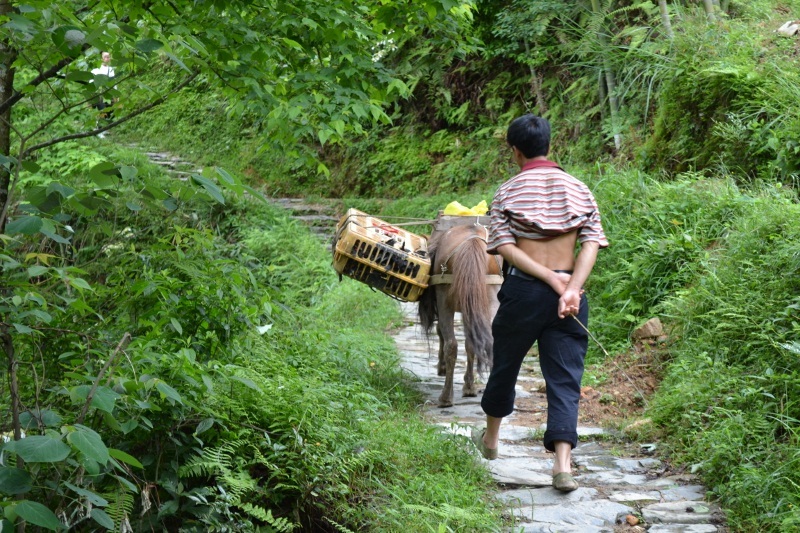 Everything in this village is carried up by a person or packed on the back of an animal. We saw everything from live chickens to rice noodles to beer being brought up on the back of mules. We even saw a Chinese tourist being carted up the mountain in a wooden chair carried by four other men. Lazy? Or smart? Those mules must work hard. And for all that effort, beers at the top are still only 8RMB! About half way into the 40 minute hike to Tiantou, it started to dump rain as thunder reverberated between the peaks; we quickly realized we were in the midst of our first monsoon. Our umbrella wasn’t doing much of anything, so we started running until we found shelter under a covered bridge. Soaking up the monsoon. The smiles came after finding shelter. 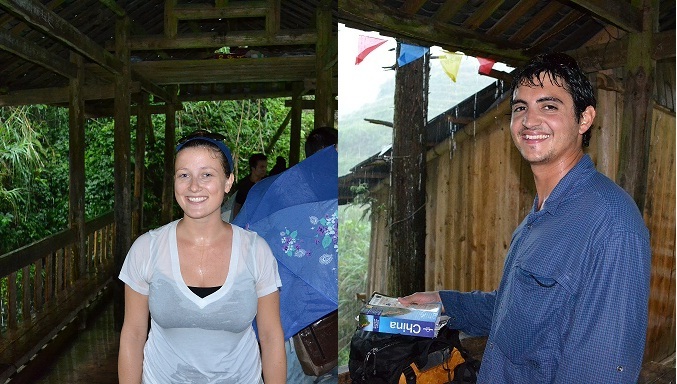 When the rain slowed down a bit, we marched onward until we finally reached Tiantou Village and came across a hostel with a spare room. Turns out the storm had caused several landslides knocking down lines and leaving the entire village without power. No electricity meant using flashlights, meals cooked by fire, no internet, and no hot showers. It lasted our entire stay and it was absolutely fantastic! For the first time since we began our journey, we truly felt off the grid. The amazing view from our bedroom’s window. The rice paddies in this region are incredible. Not only are they beautiful, but they are a true testament to the lengths people will go to create a steady source of food. The mountains are terraced into steps that seem to reach into heaven, and, with some imagination, it is easy to see where the name “Dragon’s Backbone” comes from. Crazy shaped terraces. How did they do this? 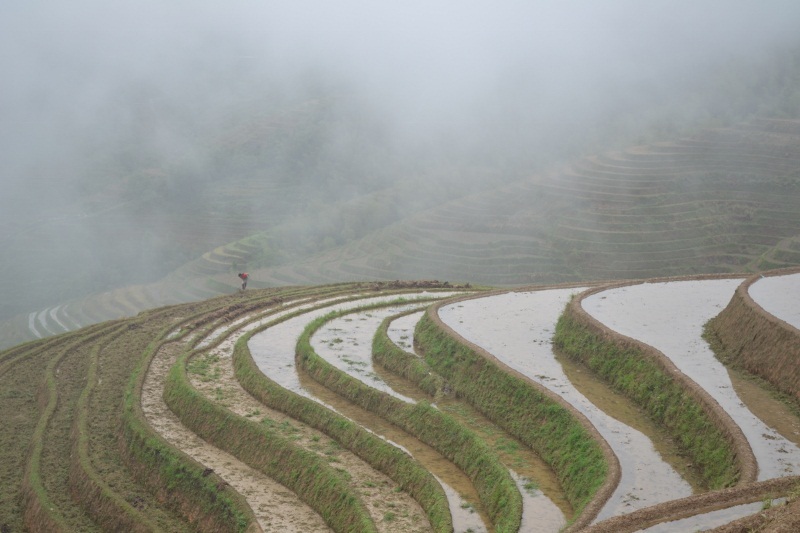 Our visit overlapped with planting season, so workers were hard at work clearing and shaping the land, filling up the paddies with water and planting seedlings in the muddy terraces. In just a few months all of the terraces will be completely filled and covered in green growth which must be a spectacular sight. Worker preparing the paddies for planting. It’s hard to believe rice is so affordable when so much effort goes into its production. The rain that we encountered on our first day persisted throughout most of our stay, but that didn’t make our time any less enjoyable. We spent a lot of time reading, playing cards, and enjoying the rain storms from the sheltered patio of our hostel. We were, however, fortunate enough to catch a break in the weather long enough for one full day of hiking. 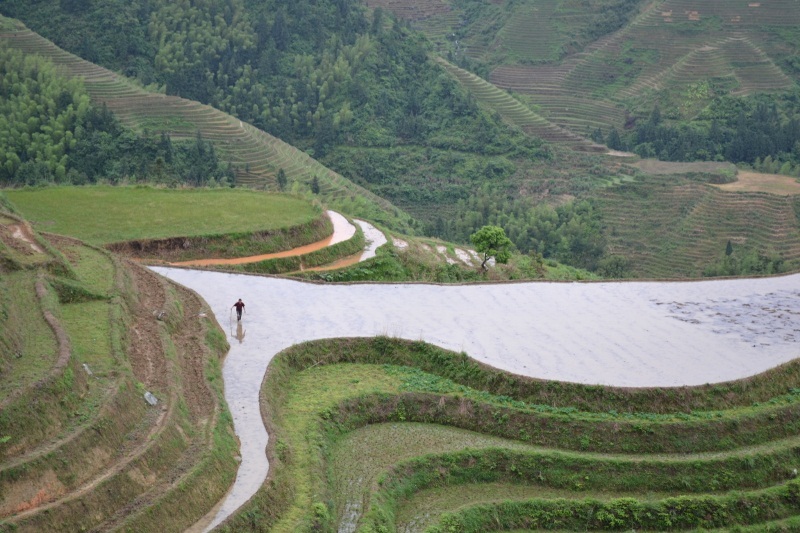 The area offers many trails that follow the contour of the terraced mountains, and steps allow you to transcend up and down between villages and viewpoints. 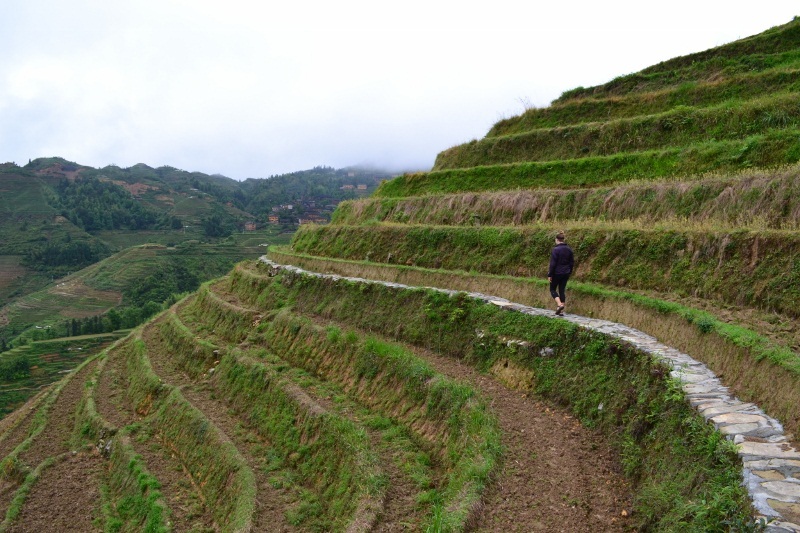 Cruising the paths through the terraced paddies. After a long day of hiking, we were tired; our legs were killing us from all the stairs. But we had to capture the excitement that we still felt from being in such a magical place. 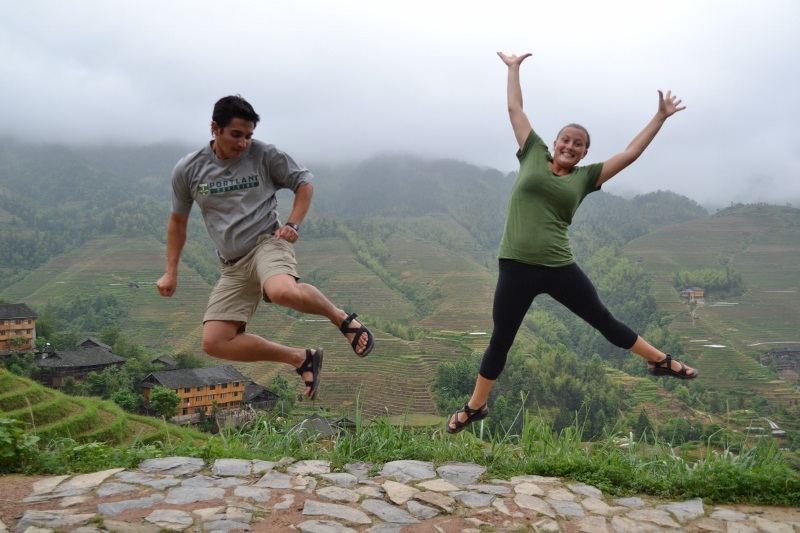 We decided to end our hike with a little photo shoot and jump for joy atop our final viewpoint. I enjoyed the pictures, it’s a work of art. True how can rice be so affordable? Glad you guys are “savoring” every moment. ps. I don’t know when/where you are planning on re-entering the US ;), but there’s space in Boston for you!